Sahal Abdul Samad will be an important presence in the Blasters midfield. 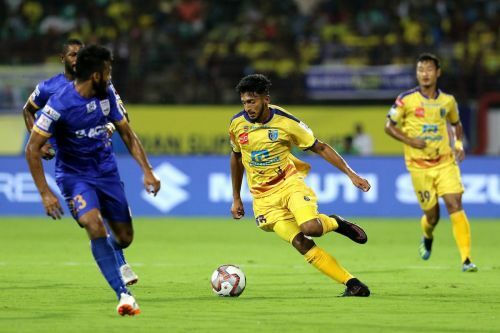 A fight between the strugglers takes place at the Jawaharlal Nehru Stadium of Delhi as Kerala Blasters visit Delhi Dynamos in Match 65 of the Hero Indian Super League. Things are not so exciting in terms of points but it might turn out to be a good watch if the teams with nothing to lose opt for a good attacking game of football. Delhi Dynamos had to wait and wait until their previous ISL match, against Chennaiyin FC, to register their first win of the season. In one of the most terrible runs of ISL, Dynamos have evaded loss only on four other occasions. This has resulted in the capital city club bagging only 7 points and a second last spot on the points table. Kerala Blasters too have a similar tale in the current season. Their only win came in the season opener against ATK. Since then, Blasters have drawn 7 games and lost 5, making it 10 points from the 13 matches. A loss to Delhi Dynamos on Thursday would result in the Kerala club being pushed one more spot down, to the 9th position. However, Nelo Vingada has been displaying a few positive signs which the fans are hopeful would change their fortunes at least to some extent. Kerala Blasters have a squad without any injuries. Zakeer Mundampara, suspended for the whole season remains the only missing man. Delhi Dynamos would be would be having high expectations on the new signing Ulises Davila. The 27-year-old had previously been recruited by Chelsea in the Premier League but did not make any appearances. Davila would be a perfect presence in the attacking midfield position to support the strikers who have been reluctant to score goals. The Mexican midfielder might be making his first ISL appearance against the Blasters on Thursday. For Kerala Blasters, Seiminlen Doungel might prove to be a valuable presence. The 25-year-old is now assigned duties at the striking end, where he has performed sporadically. Doungel had 3 shots against ATK, but Vingada would be wanting more from the Manipur born player for his team to score goals. Whether as a striker or midfielder, Doungel will be a vital man on field for Blasters. The battle between the bottom sailors might not be too interesting for the spectators, but will be so for the teams. Both the teams would want to collect some fair number of points before the seasons winds up. The fixture might be a close an as both teams do have some new names under the roof, capable of bringing in better results. However, it might be Delhi Dynamos, registering a home win against Blasters.